Milight GU10 RGBW offers you 64 hundred thousand colors and white / warm white light. 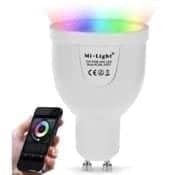 With 2.4G technology, you can remote control your light with RF remote controller or via your smart phones (for both Android and iOS systems) – switch colors, select light modes, adjust brightness and change color temperature as your desired. No extra wiring installation, just plug and use. Caution: To start your wireless control with the MiLight WiFi LED Spot Bulb, you need to have a MiLight WiFi Bridge first, which can help you control groups of bulbs. You can also choose a MiLight RF Remote Controller according to your needs. 9 different modes to enhance the hot and crazy atmosphere, making you and your friends passionate. The official site of MiLight: milight.com.